This is an unusual combination instrument which incorporates several distinct elements. The square brass plate has an alidade with folding sights which can be read against circular scales of degrees and hours. 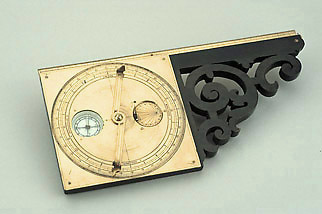 An inset compass allows this part of the instrument to be used for surveying. The compass can also be used in conjunction with a string gnomon horizontal dial arranged symmetrically with the compass. Also mounted on the decoratively carved wooden support is a brass ruler with sights which could, in principle, have been used on a plane table.